The goal of this blog is to test advanced features of Google search. Let’s see if your really use Google to its fullest. I’ll be running various queries using special syntax, and we’ll see how many results Google comes up with. Edward Snowden. This query returns 690 million of articles. “Edward Snowden”. This gives 59.8M of results because double quotes mean that we’re interested only in posts that have these words next to each other in this particular order. -Edward Snowden. This gives 490M. The minus sign in front of Edward means that I want to exclude the word Edward from the search. Hence I’m getting only those posts that include Snowden, but not Edward.At this point some smarty pants think what if I put this dash in front of each of these words. 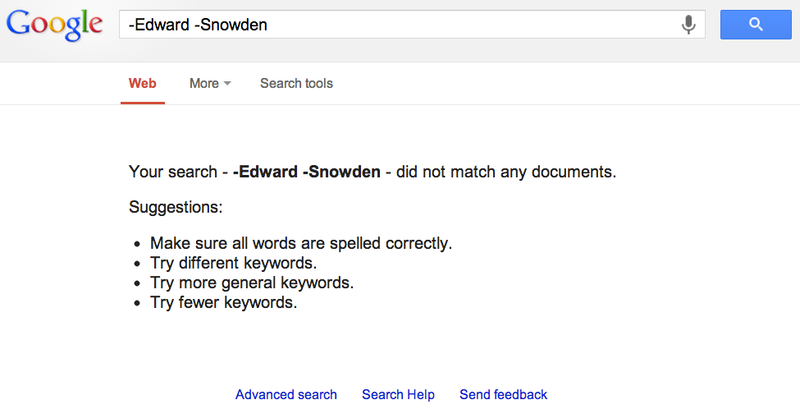 Don’t waste you time – if you ask google to exclude every word, you’ll get nothing back as shown below. Edward Snowden:lenta.ru gives only 309K posts because after the colon I specified that the search has to be done only within the Russian news portal lenta.ru. In the unlikely event that you don’t read in Russian yet, try Edward Snowden:cnn.com to search within cnn.com, but you’ll have to sift through 56.8M articles to find something useful. If you are still struggling with learning English, here’s another advice on how to learn this great language using Google. Wow, Al Jazeera has 5.5M posts on the subject with Edward Snowden:aljazeera.com. Let’s search all Russian sites (they end with .ru). Edward Snowden:.ru gives 5.9M articles. The wild card in searches means anything. It’s represented by an asterisk. For example, “Ed * Snowden” means find all articles that have ed followed by anything as long as it has Snowden after that. You’re going to get 133M results. If all this sounds like a rocket science, then just click the link Advanced search at the bottom of any Google page with any results. You’ll get a form to will out, which will let you limit the searches without memorizing all these search formats. By the way, at the top of your search result page there is a button Search tools. Click on it, and you’ll be able to filter your search results by the publication time, location and more. Raise your hand if you started reading this blog hoping to find the whereabouts of Edward Snowden? I know. Sorry, can’t help you with this. I’m sure you understand that if the US authorities really wanted to get him, they’d do it long time ago. A quick operation (remember who they killed Osama?) in the Sheremetyevo waiting zone and Snowden is dead. The time didn’t come just yet. They need to get people involved into this “Where in the World Is Carmen Sandiego?” type hunt to draw public’s attention from what pissed off Mr. Snowden. Finally, a million dollar question to Google. How do you explain that the search on sheremetyevo returns 4.65M articles, but sheremetyevo -Snowden returns 5.1M results? I’d expect the second number to be lower? This question should be asked during job interviews at Google. Stop asking already how many piano tuners live in San Francisco, will you?